Have a garden question as we move into fall and winter? Send them to Pat Munts at patmunts@yahoo.com or mail them to the Spokesman Review, 999 W. Riverside Ave., Spokane, WA 99201. After reading your article last week, I was hoping you might be able to give my husband some advice on his planting of arborvitae bushes. He planted some bushes last year and they did not survive. This year he tried again. He dug holes larger than the root ball and added new soil before planting them, then gave them a good watering. Is there anything else you would recommend he should do? Thank you for your help and expertise. Arborvitae or pyramidal cedars are a very versatile hedge plant. As versatile as they are, they do have two major drawbacks. They can’t handle drought and the deer think they are candy in the winter. You don’t say how much and how often the plants were watered after they were planted but I suspect they didn’t get enough water through the summer. 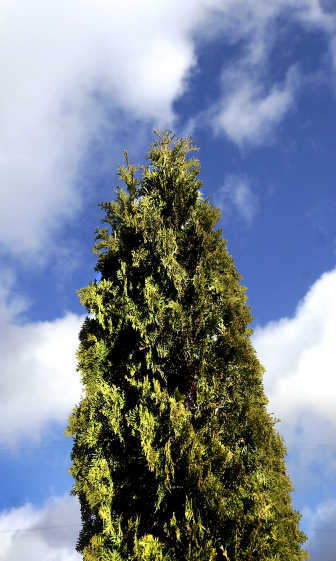 Arborvitae, especially young plants, need deep watering every week to 10 days through the growing season. One of the best ways to do this on a new planting is to lay a soaker hose through the planting and set it on a faucet timer. Run it for a couple of hours and then dig down to see how far the water has soaked in. If it’s not going down a foot, add more time until it does. Don’t rely on yard sprinklers as they aren’t set to run long enough to get enough water into the ground for the plants. As to winter damage caused by deer I am collecting pictures of what people do to protect them. Everything from electric fences, wrapping with shade cloth or wire fencing, and my favorite, just trimming the plants up above deer height (seven feet because the deer stand on their back legs to nibble). This last one creates some really funny-looking Dr. Seuss plants. Don’t wrap them with plastic tarps as the plants need light and air through the winter. I have four Rose of Sharon that are over a year old. They grew quite tall this summer and bloomed beautifully. Do I cut them back in the fall, in the spring, or not at all? I love them and they do well, as they are protected by the house. As you have found, Rose of Sharon or hibiscus syriacus is easy to grow. It is best to cut the previous year’s growth back to two buds in late winter and shape the plant as needed during the summer. Mulch plants with a foot or so of compost or two feet of pine needles over the roots now. This will provide some protection and allow the lower stems a better chance to survive and start the plant over if it gets really cold.